Tonight’s test features the Asus VivoBook Flip 14 TP401NA, an ultrabook convertible into a 14-inch tablet with a beautiful screen and running in complete silence. Asus installs its VivoBook Flip 14 TP401NA in a slim and compact case made of metal (on the back of the screen) and plastic (elsewhere). Very well assembled, the gray all-dressed chassis shows no room offset or other unwelcome voids but the tester would have liked more robustness. The surfaces generally lack rigidity and tend to bend under pressure. 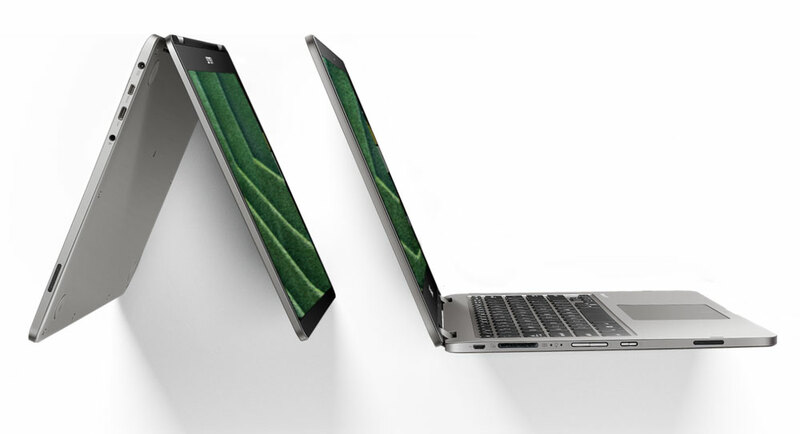 There are only two USB ports provided on the ultrabook, a micro-USB 2.0 and a USB 3.1 Type-C. This means that you will probably still need an appropriate adapter to connect peripherals such as USB sticks. The HDMI output also requires an adapter, Asus having chosen a microHDMI port. Good point, Asus has integrated a standard card reader. In the absence of a dedicated hatch, it will open fully the bottom cover of the ultrabook to enter his bowels. Attention: screws are hidden under the two rubber feet. Once inside, we discover a slot M.2 2280 free, which allows to add a SSD thereafter. A nice surprise. The chiclet keyboard does not benefit from backlight but the typing experience is very satisfactory. The reason: the surface under the keyboard does not bend under the pressure and the actuation point of each key is precise. And this despite a short race. For its part, the touchpad provides a large input area that supports multitouch gestures without latency. The integrated mouse buttons are sharp and precise. The touch screen of the VivoBook Flip supports 10 touch points. It responds quickly to inputs whether it\’s on your finger or with an active stylus. The 14-inch slab of the Asus VivoBook Flip 14 TP401NA under test features a Full HD (1920 x 1080px) resolution, a high contrast ratio (1205: 1) and wide viewing angles allowed by the camera. IPS. On the other hand, the brightness level could have been higher (239.1 cd / m2) and the colorimetry a little richer since the sRGB space is covered at 59% and the Delta E is around 4. These readings are all of even very honest for the price charged. Note however that the display uses dynamic brightness (PWM) up to a brightness level of 90%, which can cause annoying flickering for some sensitive people. Built around a state-of-the-art N4200 Pentium Quad Core, 8 GB of RAM and a 128 GB eMMC, the model tested has the best configuration at the moment. It is also according to the tester of the most “viable” for a current office use. For example, Internet browsing, Office work, or video playback are easy, as is multitasking. EMMC storage never equals the responsiveness of a dedicated SSD but provides a good level of fluidity to the system. What\’s more, its capacity is rather honest compared to versions with 32 GB or 64 GB. Big highlight of this Asus VivoBook Flip 14 TP401NA, it integrates neither ventilation nor mechanical hard disk. Its operation is completely silent. Temperatures are passively dissipated and never exceed the comfort limit. It is around 6 hours and 30 minutes in Internet browsing with active WiFi, it is average.